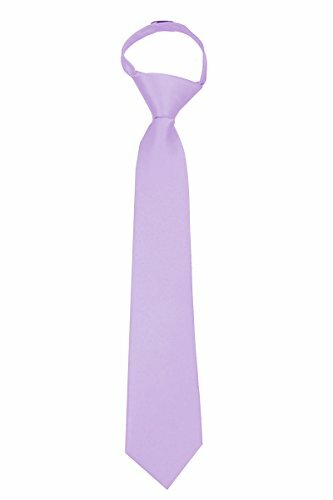 This Solid color boy's 14 inch zipper necktie tie has a luxurious satin finish that really accentuates color and makes for a very durable tie with a great knot. Measures 14 inches from the top of the knot to the tip of the tie and is 2.50 inches at it's widest point. The perfect boys zipper necktie for weddings, groups, parties, or individuals. Many matching styles, colors, and sizes available. Perfect for boys 9 - 13 years old. The side image shows this zipper tie on a Boys Dress Shirt. Best selling shirt and dress pants combo for boys. 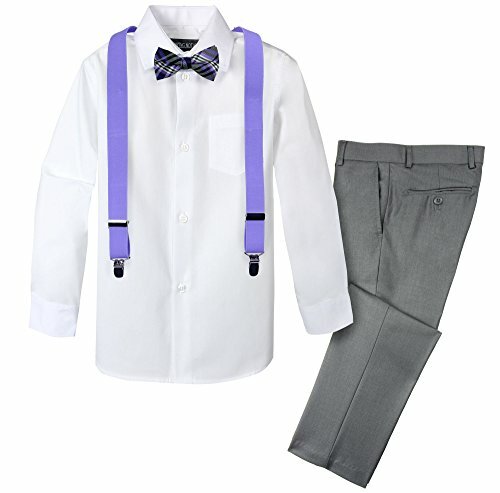 Set includes shirt, pants, suspender and either bow tie or necktie. Flat front boys' dress pants with two side pockets and two back pockets. Elastics waist for up to size 5. 70% polyester, 30% rayon.Dry clean only. Shirt is 35% cotton and 65% polyester. Machine wash cold with like color. Imported. 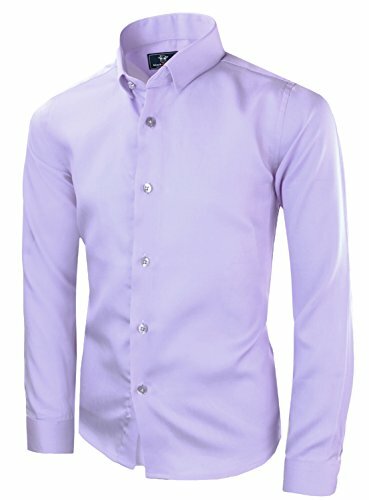 This boy's lavender dress shirt is by Daniel Ellissa. It features a classic button-front, laydown top fused collar, chest pocket, and adjustable cuffs. This shirt is full comfort cut from wrinkle-resistant soft poly/cotton blend fabric. It is crafted with a rounded bottom for easier comfort in tucking it in and wear. 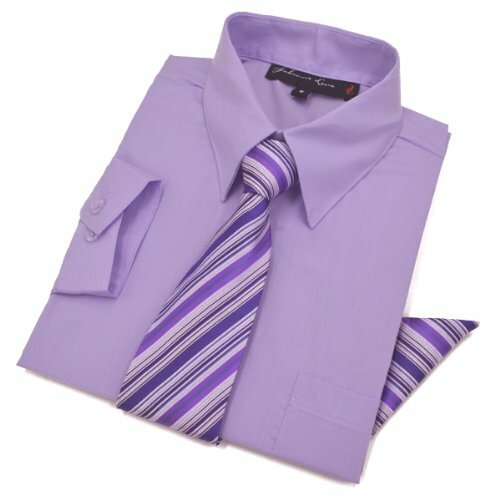 This shirt includes a fashion designer neck tie and pocket square. It is featured in several striking colors of black, coral, denim blue, hot pink, ivory, lavender, light blue, light grey, light pink, lime green, mint, mustard, peach, purple, red, royal blue, turquoise, and white. 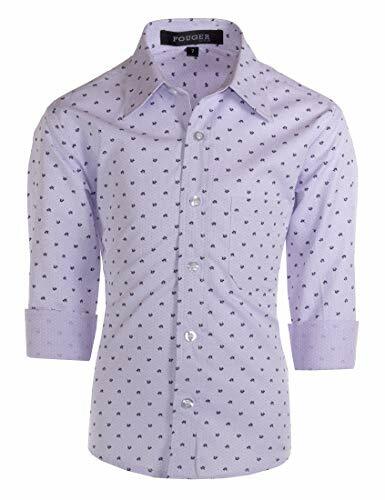 This high quality dress shirt is perfect for school uniforms, dance team, Sunday's best, weddings, prom dances, photographs, every day and all of your other special celebrations! Boys Slim Fit Long Sleeve Dress Shirt - Gryffin This boy's slim dress shirt is by Fouger USA. 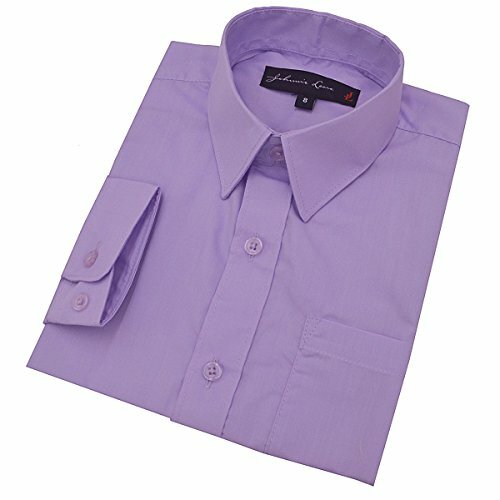 It features a classic button-front, lay-down top fused collar, chest pocket, and adjustable cuffs. 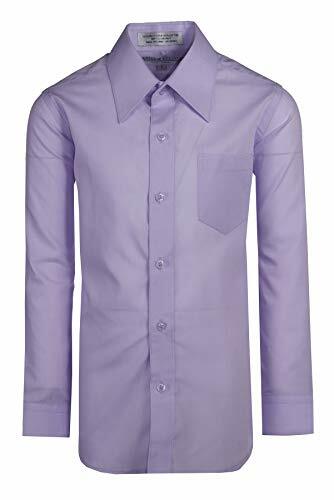 Includes: - Long Sleeve Designer Dress Shirt Features: - Long Sleeves, Button-Up Front, Chest Pocket, Full Lay-down Fused Collar, Barrel Cuff Colors: - 4 Popular Colors : White, Light Blue, Lavender, Aqua Blue Sizes: - Available in Boys Sizes 1, 2, 3, 4, 5, 6, 7, 8 ,10, 12, 14, 16 Fabric Content: - 65% Polyester 35% Cotton Fabric Wash: - Machine washable, and may be washed separately or with similar colors. Tumble dry and warm iron. 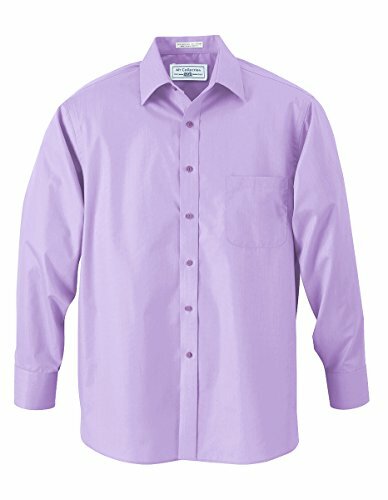 This shirt is a slim design cut from wrinkle-resistant soft poly/cotton blend fabric. It is crafted with a rounded bottom for easier comfort in tucking it in and wear. This high quality dress shirt is perfect for school uniforms, dance team, Sunday's best, weddings, prom dances, photographs, every day and all of your other special celebrations!